Visiting castles in Ireland usually comes at a cost, but the Ormond Castle at Carrick on Suir in County Tipperary, Ireland, is a free bonus visit, courtesy of the OPW (Office of Public Works) who are the guardians of this beautiful place which was reconstructed and renovated lovingly under their care. The original medieval Ormond Castle was a stronghold securing a strategic spot on the river Suir. The original castle dates to the 1300’s. It belonged to a branch of the influential Butler family whose first member, Theobald Walter, arrived in Ireland with the first wave of the Norman invasion. Of this castle only a couple of towers that were added on in the 1450ies have survived but not much else. 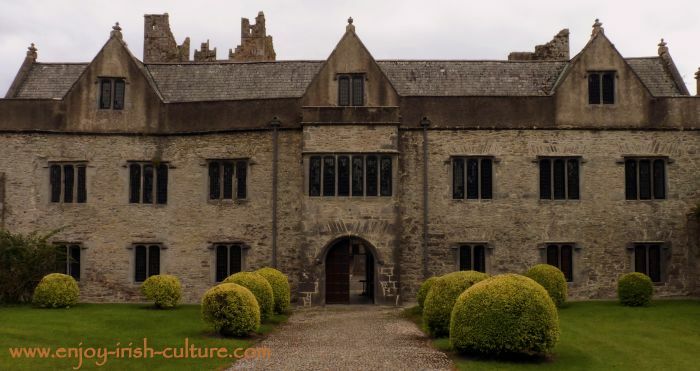 The main reason visitors frequent the site today is to see the remarkable Renaissance manor house, the earliest of the unfortified castles in Ireland, and now the only one remaining of this early group. 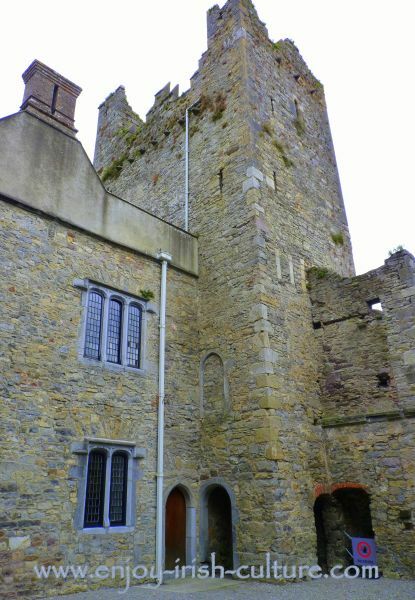 Medieval tower at the Ormond Castle. The Renaissance manor house was added on by Thomas Butler, 10th Earl of Ormond, a cousin to Queen Elisabeth I, in and around 1565. The Renaissance manor house marks a shift in architecture and thinking away from fortified medieval castle to open, airy spaces with large windows, demonstrating the family’s standing in society as well as their wealth. Built in the Elizabethan style, the manor house was Thomas’ personal tribute to Queen Elizabeth. To give you an idea of just how avantgarde Thomas was- only a handful of unfortified manor houses were ever built in Ireland before the time of the Cromwellian invasion in 1649, with the major boom not starting until the late 1600's. The Ormond Castle manor house was restored between the 1950ies and 1980ies. The building still contains original timbers dating from the 1600’s as well as some original floorboards. There are lots of butterflies living under the roof and a protected species of bats come here to breed. During their breeding season the attic is off limits for visitors. 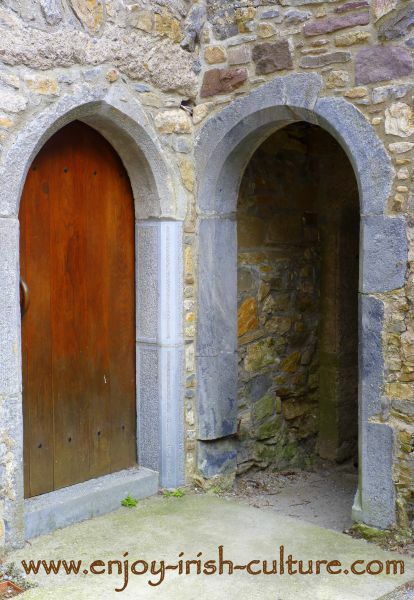 Castles in Ireland- beautiful medieval archways at the Ormond Castle. Carrick on Suir is located on the N 24 Limerick to Waterford road which you will hit at either Waterford or Clonmel coming from most directions, then follow signs for Carrick. Once at Carrick on Suir you will have to follow the one-way traffic flow around the town looking out for Castle Street and a signpost for the Ormond Castle. There is a free car park just outside. From Dublin: Carrick on Suir is easily reachable form the M9 Dublin to Waterford motorway. Take the motorway to the very end, then follow signs for Limerick, Clonmel and Carrick on Suir, taking the N24 Waterford to Limerick road. 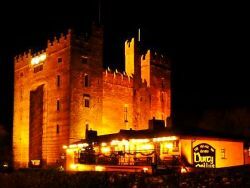 Travel time by car from Dublin City is just over 2 hours, from Killarney 2 hours and 20 minutes, from Limerick and Cork 1.5 hours, 1 hour and 15 minutes from Wexford, 45 minutes from Kilkenny, 30 minutes from Waterford, and 20 minutes from Clonmel. The castle visit is free, which is always good news, right?! Opening season is late April until early October. If in doubt, give a ring to confirm the castle is open (+353 51 640787). Opening times are 10 a.m. to 6 p.m. daily. Access is by guided tour only. Plan about 40 minutes for the guided tour, and twenty minutes to have a look around the exhibition and medieval castle ruin. Arrive no later than 5 p.m. There are toilets, and there is a free public car park outside, but there is no coffee shop and no gift shop. Enquire about disability access. The Ormond Castle is one of the best castles in Ireland. If you are in the area at all, go. It is a lovely way to spend an afternoon or morning with the family. A visit here is a great way to familiarize yourself with a little known piece of Ireland's history. What did we like best about our visit to the Ormond Castle? I would have to say it was the wonderful smell of the old timbers dating to the 1600’s in the attic. The smell let’s you know for sure that this is a really special place. It made me feel as if I had been transported into a Shakespearean drama. As I was contemplating this idea walking the length of the attic, I heard my six year old son say to the guide that the attic smelled of fairy magic. He noticed it too! 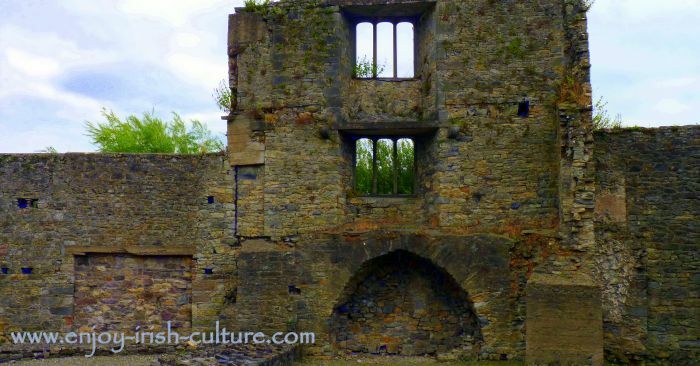 Visit a real medieval castle nearby, the immaculately restored Cahir Castle, (a 35 minute drive from here) a wonderful adventure for the whole family. Go for a walk in the medieval town of Fethard (35 minutes drive from here) which features the best preserved Norman era town walls in Ireland, and stop for a coffee at McCarthy’s Pub there, another pub that lays claim to being one of the oldest in the country, and is supposedly haunted. Combine your visit with a half-day walking the medieval streets of Clonmel (a 20 minute drive from here) and taking in the lovely atmosphere of this buzzing little town which has plenty of shopping outlets and places to eat. Combine your visit to the Ormond Castle with another freebie- a visit to some very old Celtic High crosses at Ahenny which is a 15 minute drive away. The guides at the castle will be able to give you directions. We hope you got a lot out of our page on visiting one of the more unusual castles in Ireland- the Ormond Castle. We love writing for you! A small ask in return- would you please kindly use any of the social functions we provide to tell the world about our website so that other people can enjoy the reading material, too! You will find these at the top left, and at the very bottom of the page. Many thanks!